Graphic design is a creative process – most often involving a client and a designer and usually completed in conjunction with producers of form (i.e., printers, programmers, signmakers, etc.) – undertaken in order to convey a specific message (or messages) to a targeted audience. The term "graphic design" can also refer to a number of artistic and professional disciplines that focus on visual communication and presentation. 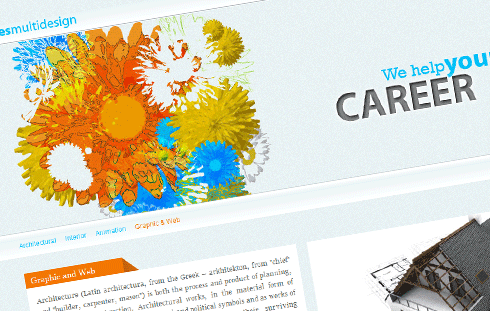 The field as a whole is also often referred to as Visual Communication or Communication Design. Various methods are used to create and combine words, symbols, and images to create a visual representation of ideas and messages. A graphic designer may use typography, visual arts and page layout techniques to produce the final result. Graphic design often refers to both the process (designing) by which the communication is created and the products (designs) which are generated. "Graphic Designing" in our Graphi Designing course we are giving training in all graphic designing softwres that wiil help you to become a best designer in Brouchere Designing, Visiting card designig, Posters and Notice, Flex designing and Hording Designing in a perfaction . "Web Designing" In web designing we are only deling with designing to hosting with relevent softweres with animation and action scripting .